I see a sunset and I gasp. The colors and depths and dreams never fail to take my breath away. Things of this earth matter not in that moment when you’ve been transported to the heavens on the ridges of golden and rose colored clouds. If I am home when the sunset starts to glow, I run. I run to the back hill, up and down it, to my weeds. I bend down close and low. I look at the world from their vantage point and I aim for a portrait of weed against brilliant sky. Captured! Mustard grass sunset! 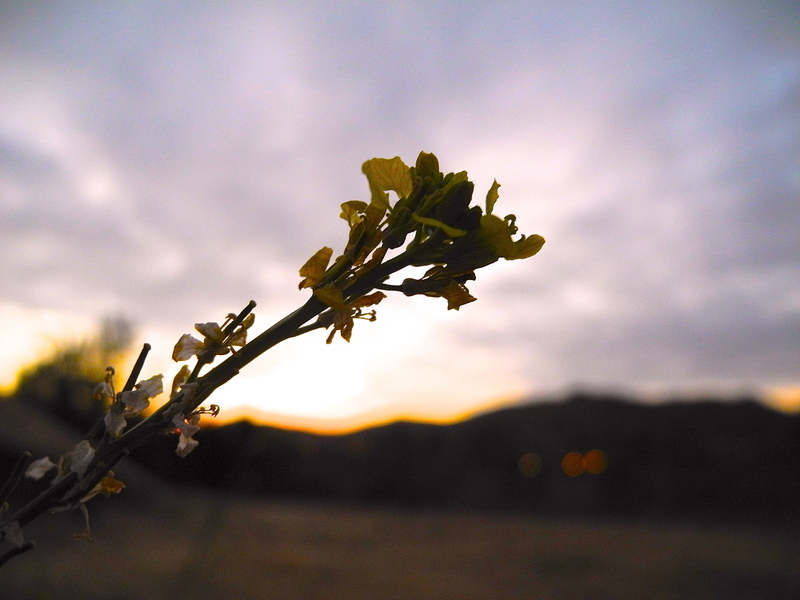 This wand of unassuming yellow flowers has spent days becoming raggedy in the wind but tonight, they rest and point to the sky. They offer perspective to the starting point that we all share. Ground level, in the dirt, up we rise towards the sky. With every day of stretching and striving and biding our time we aim to grow closer to the eternal. Whether we choose to follow the eternal ties that bind us or free us, there is no escape from the mortal coil and our desire to fling ourselves into playtime with the immortals. Go mustard go! Let us, you and I jump and fly into the sky!